Insights and Rants: MacBook is Windows Compatible? No seriously. This was definitely one of those laugh out loud moments; followed by desperate searches for the Advertising Standards Authority phone number. Oh, wait! They're closed for Christmas, so by the time they get to slap Apple over the wrist for a false advertising complaint, it will be too late. So here is my public service announcement for the week: the iMac and MacBook products listed on the flyers that are doing the rounds in your local newspaper are not only Windows Compatible, they're DOS and Linux compatible as well. And if you believe that you'll believe anything. You can't install any Windows programs on a mac, since there are no Windows applications that run on OSX. Try installing Microsoft Access and call me if you can get it to work. There may be equivalent programs for the mac, such as Firefox and OpenOffice.org, or even a mac version of Microsoft Office, but you have to buy these separately. It's called the Apple tax. Alternatively, you partition the drive and install Windows Vista on your mac. In order to do that you have to cough up R3249 for a retail copy of Windows. Then your old Windows apps will install and run, at least on the iMac. If that's what you call compatible then you might as well just install Ubuntu and be patriotic. I wonder if Apple South Africa will be forced to give refunds to everyone who believes this kind of marketing? Do they really disrespect their customers that much that they want to lie to their customers in order to get them to buy their products? I thought only timeshare companies did that. The full pamphlet is shown below. Click on the image for a full size (scanned) version. Update 31 Dec 2008: Apple UK sent me the following link, which explains how to set up Windows on a Mac. But you have to buy the book for £24.95, plus you have to buy Windows, so the advertising is still misleading, because the implication of the flyer is that it is all included in the price, which it isn't. It also doesn't mention that Apple provides no technical support for Windows. Now you no longer have to choose between Mac OS X and Windows. 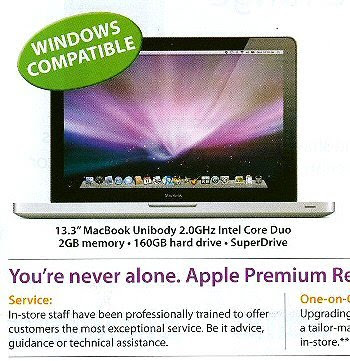 The latest Macs from Apple can run both Mac OS X and Windows, so you’re not limited to just one operating system. Running Windows on your Mac explains how this simple technology works and walks you through every phase of the process of setting up Windows on your Mac. Are you a Windows user who’s buying your first Mac? A Macintosh user who needs to run Windows software? Or just a computer user who wants the best of both worlds? There’s something in this book for everyone. You’ll find detailed instructions for installing Windows on your Mac in three easy ways; a friendly guide to the Mac for Windows users; and a handy reference to Windows for Mac users. Load and configure the two most popular Mac OS X virtualization programs, Parallels Desktop for Mac and VM ware Fusion. Install Windows easily, either in Parallels or Fusion, or with Boot Camp. Keep your Windows installation in top shape, free of viruses and spyware. Run Windows applications alongside Macintosh programs. Add your new Mac to an existing Windows network. Explore the intricacies of a new operating system, whether it’s Mac OS X or Windows. My complaint is that the goods on offer, as shown and configured, are not “Windows Compatible” as claimed: the user has to purchase a full retail copy of Windows to use on the machine, at a cost of around R3000, which is a significant amount. The average buyer cannot simply buy an Apple computer and install and run his favourite Windows game or application, which is what “compatibility” implies. If the average buyer has a Windows install CD from a previous machine, installing this software on the Apple computer would be illegal software piracy. Also, it should be pointed out that neither Microsoft nor Apple provide any support for Apple computers with Windows installed, and the buyer should have been warned. The advert is thus misleading because of the omissions. I feel that some kind of explanation should have been provided, even just an asterisk and the words “additional unsupported software and configuration required”. There is enough space on the advert for such a disclaimer. You mention that the product does not include windows [sic], and is therefore misleading. ... The advertising does not offer windows [sic] but communicates to a consumer that should they expect windows [sic] access, the Apple computer would support this function. Precisely, but at what cost? Over R3000, without the labour and computer skills required! 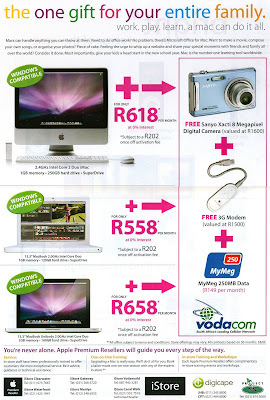 Considering I paid R 3800 for a new computer that includes Windows Vista, that is not an insignificant amount. I guess that's chicken feed when compared to the cost of a R24 000 Macbook Pro, but the cost is still an extra 12%. One wonders what the ASA would say about an advert for a Ferrari being "Caravan Compatable"? Anyone who knows anything about cars would say it would be misleading and outrageous because of the extra cost and damage to the engine. What would the ASA say about this? 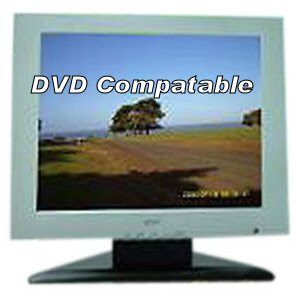 A TV may be DVD compatable, but you have to buy a DVD player to play DVDs. And DVD players are a lot cheaper than a retail copy of Windows. I've always assumed what they meant was that you can install windows on the machine ... "windows compatible". Since the PowerPC to Intel migration this is the case. Just as I have OSX installed on my standard PC. Yours is an interesting interpretation of the ad. I saw it and immediately thought "awesome, I could install windows and dual-boot". The ad was pretty accurate - the hardware is windows compatible. I would agree with you if they had stated that the computer was compatible with with windows applications. On the other hand, I am a "power user" (I write software professionally and for fun), so my point of view may be a little less common than I'd expect. For me, "windows", especially within the context of hardware, means just that - some version of Microsoft's operating system - not windows apps.